Even if you follow a diligent home care routine, scheduling a regular dental appointment with a dental professional is still a must. While they may not seem like much, a routine checkup is essential for maintaining a healthy and functional smile. Otherwise, serious problems can arise and have a negative impact on the health and appearance of your smile. 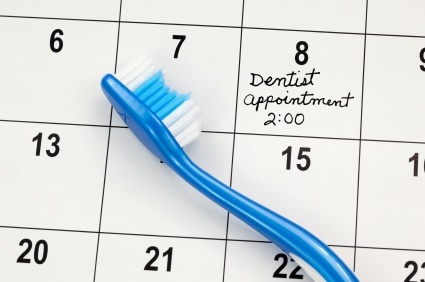 What should you expect from a routine dental appointment? What Happens During Your Cleaning? If you are due for routine x-rays, we will begin by taking updated films. During your cleaning, the dentist or one of our expert hygienists will use a scaler (a small metal instrument with a blade-like end) to scrape off tartar above and below the gum line. Or he or she may use an ultrasonic vibrating device to shake loose plaque and tartar and then rinse it away with a stream of water. We will then polish your teeth with a lightly abrasive paste and finish up with a flossing. The now-smooth tooth surfaces make it more difficult for plaque to accumulate before the next cleaning. When you see us for your dental appointment, we will carefully examine your teeth, gums, jaw, and oral tissues. We will also refer to your most current x-rays to help to assess your oral health. The purpose of the exam is to accurately assess your current oral health and if possible, identify problems developing in their earliest stages. When patients attend routine checkups as recommended by the Dr. Thomas L. Anderson or one of our gentle dentists, we tend to uncover problems before they can lead to complications that require more extensive treatment options. How Often Should You Have One? The American Dental Association recommends regular dental appointments every six months and we agree! Children (once their first baby teeth erupt), teens, adults, and seniors all benefit from regular exams every few months. Those with high risk factors of gum disease and other oral health issues may benefit from an exam every three to four months. If you have any questions or if you would like to schedule one for yourself, then contact our team today! Do You Have Questions About Checkups? We can provide a thorough exam to assess the health of your smile. At Thomas L. Anderson and Associates, we can help to ensure you maintain a lifetime of healthy smiles. We proudly offer our services to the Kansas City Metro and surrounding areas. Contact us today at one of our three convenient locations to schedule your dental appointment or to learn more about our other services. Contact us today to schedule your dental appointment and meet with our skilled dentists at one of our three conveniently located dental office locations within the Kansas City area, including Lee’s Summit / Independence, the Country Club Plaza and Downtown Kansas City. The gentle dentists and expert team at Thomas L. Anderson and Associates look forward to working with you to treat your dental emergency, achieve proper oral health and a beautiful smile that will last a lifetime. If you have any questions about your dental insurance benefits, please do not hesitate to contact us. We are happy to review your policy! Please give us a call today to schedule an appointmentand become part of our dental family.